HOW IT WORKS: Video Booths are usually associated with individual video message recording when people can leave a message recorded on video. HOW TO BUILD: Basically you can convert your existing photo booth into video booth or you can build a Video Booth as you would build the photo booth. 4. Photo/Video Booth Software that will be able to record video. Basically the difference between the Photo Booth and Video Booth is the end result (photos or videos). When you combine the Photo and Video Booth you will be able to deliver both products and better yet you can offer even more than photos and video messages. In this article we will introduce you to the PTBooth A1 PRO custom photo booth software. 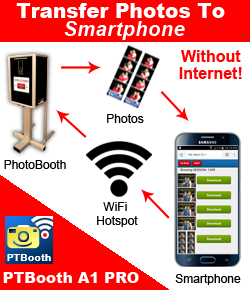 With the PTBooth A1 PRO photo booth software you will have the ability to do individual video message recording (look at the sample video above) as well as recorded videos during the actual photo session. We call these "photo booth bloopers". These photo booth bloopers capture funny moments that happen while the photo sessions are happening. You'll see and hear all the laughter, crazy sounds and hysterics that take place while the photos are being taken. Want to see what we are talking about? See a sample here. Photo Booth only – takes and prints photos, records video during photo sessions. Take a look at the video below to see all options in action. Saves all photos in one folder which allows using third party social media upload software. · Options to save / copy of print as PDF or JPEG. · Customizable Skins allowing you to change the appearance of the software. · External monitor display. You can display live feed of the photo booth activity or just one image. · Use of Canon camera and/or Webcamera. · Control of the number of photos taken per session. · Exclusive print templates creator. · 23 default pre-designed templates. We hope this article will help you to make sound decisions when it comes to building your Video Booth.